With more than one-third of freshwater fish species threatened by extinction, they have become the most endangered group of animals on the planet, according to British scientists via The Telegraph. Several UK river species are at the highest risk of dying out, such as Shetland charr, European eel and rarely known fish that exist in small waterways throughout Scotland and Wales. 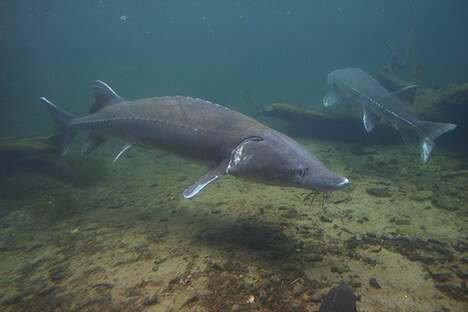 Sturgeon, used for some of the world’s most expensive caviar, are also at a high risk of extinction. (Suggestion: Stop eating caviar, that has got to be the most ridiculous delicacy on the planet). Scientists studying these findings claim it’s humans making the greatest contribution to this risk of extinction, with pollution, overfishing and construction all leading the way to killing off species of freshwater fish. Humans around the world could be seriously affected by the extinction of freshwater fish. More than 7.5 million people in Africa alone depend on the species for food and income. More than 36 percent of the fish are threatened, compared to 21 percent of mammals and 12 percent of birds under extinction threat. The vast destruction of the fish population could severely affect food supply for millions of people, including those in developing nations. Freshwater ecosystems are used for food, energy and other resources. According to the International Union for Conservation of Nature’s Red List, it is important that humans find ways to utilize these resources without sacrificing entire species of animals. Cutting down on overfishing and obtaining resources without putting fish at risk or polluting ecosystems would be a good start.